Enoch Wood (1759-1840) had, from about 1784, been working for himself (possibly with his cousin Ralph Wood) but on 1st January 1791 Enoch went into partnership with James Caldwell (1760?-1838) and construction began immediately on a much larger factory. While Enoch Wood was to concentrate on the running of the actual pottery, it would appear that James Caldwell, bringing a very different but complementary mix of skills, worked outside the company. James Caldwell was a man of many hats. He was a lawyer and a businessman, was a very close friend of Josiah Wedgwood and was widely known by many people in the Staffordshire potting community. In addition he was already considerably well off and was able to invest significant funds to help the firm to grow and prosper. This partnership of Potter and Lawyer was to last for 27 years up until July 1818 when James Caldwell (approx 58 years of age) retired from the partnership. 1. A catalogue list of all known Wood & Caldwell wares. 2. Information about Enoch Wood, James Caldwell and the other people directly involved in the Wood & Caldwell company. 3. Information about the wider pottery community and markets. I feel that the best place to start is to build up a catalogue list of the known Wood & Caldwell wares, as this has not been done in any great deal to date (to my knowledge). With the power of the internet information highway (and digital cameras), I feel we now have an opportunity to make a very detailed attempt to bring this information together and make it more available for everyone. 1. "The Wood Family of Burslem" by Frank Falkner, published 1912 (excellent book). 2. "Collecting Old English Lustre Ware" by W Bosanko, published 1916. 3. "Old English Lustre Pottery" by W D John & Warren Baker, published 1951 (extensive illustrations). 4. "Old English Lustre Ware" by John Bedford, published 1965. 5. "A Collector's History of English Pottery" by Griselda Lewis, published 1969. 6. "Staffordshire Portrait Figures" by John Hall, published 1972. 7. "The Price Guide to 18th Century English Pottery" by Sally Mount 1972. 8. "English Earthenware Figures" by Pat Halfpenny, published 1991 (another excellent book). 9. "19th Century Lustreware" by Michael Gibson, published 1999 ( I am informed that this is a good book). 10. "People, Passions, Pastimes, and Pleasures: Staffordshire Figures 1810-1835" by Myrna Schkolne, published 2006. 11. Records in the Wedgwood Archive at Keel University (letters, receipts and manuscripts). 14. Diaries of James Caldwell (Extensive archive, not published, volunteers needed to help with transcription). 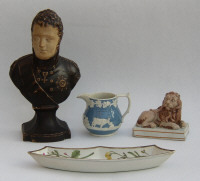 To see the catelogue list of Wood & Caldwell wares identified so far please click here. For more information on James Caldwell please go to www.jjhc.co.uk and click on James Caldwell.